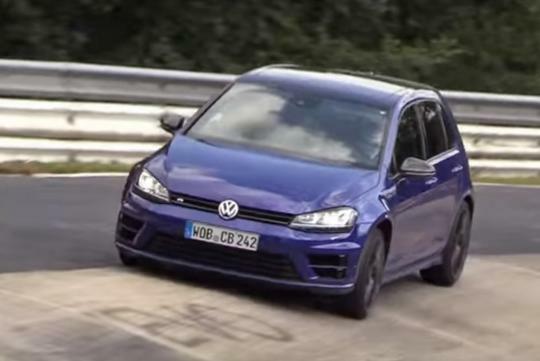 A prototype of a Volkswagen Golf R with a five cylinder engine has been filmed going around the Nurburgring. Published by youTuber, cvdzjiden, this special Golf R was supposed to be the production version of the R400 concept a few years ago. However, the plan to build it was shelved as the company was involved in the emissions scandal. As for the car seen in the video, Golf fans would have noticed the car sounds very different in the video as compared to a normal Golf R. In fact, it sounds very similar to the 2.5-litre turbo five pot that resides in the Audi RS3 Sportback and sedan. Look closely and you can also see that the Golf wears the RS3's dual tip tail pipes instead of the usual Golf R's quad pipe setup. According to the video's description, the car is said to be making 420ps or 414bhp, a substantial jump from the Golf R's 306bhp. Will the car make it into production? No one knows. But we sure hope it does!